Chest+Back+Balance launches you into the Strength Phase of X2. For those of you who did P90X One-on-One Volume 3, this workout is almost identical to the more edgier titled Chest, Back & Balls. There are no “regular” pull-ups and standard width push-ups. This is the NEXT LEVEL. And if you did not do the 1-on-1s, be forewarned that it will take practice to try and master the moves. The tip of the day is “Modify To Finish”. If you have never done push-ups on stability or medicine balls, it is going to take time. It is going to take some modification to get it down. You will notice that you are not doing nearly the number of reps that you do in P90X Chest & Back. These moves are slower, more synergistic, and engage the entire body. In my opinion, this workout contains the hardest pull-up and hardest push-up moves. And I am still working hard to try and master these two moves (as you will see in my workout below). The Lever Pull-Up is a gymnastic move and takes significant total body strength. Heck, I thought my form was pretty good until I saw myself on film and needed to make some pretty drastic changes to get it right. The Possible/Impossible Push-Up is the other really tough move. When I first practiced these in the 1-on-1s, I would put the stability ball against a wall and then slowly I woud try and do one without the wall…and then maybe two. It always starts from doing that first one team. Then after that, you just try and keep doing one more. When I look at other great Chest & Back workouts like the 1-on-1″ 30/15 Routine” (See my review HERE), this workout definitely takes the most skill and practice. Conversely, 30/15 is really hard because of the pure number of reps and exercises. 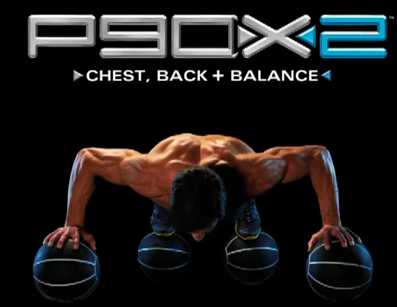 Out of all the new P90X2 resistance workouts, this was one of my Top 2 favorites. Get Ready!